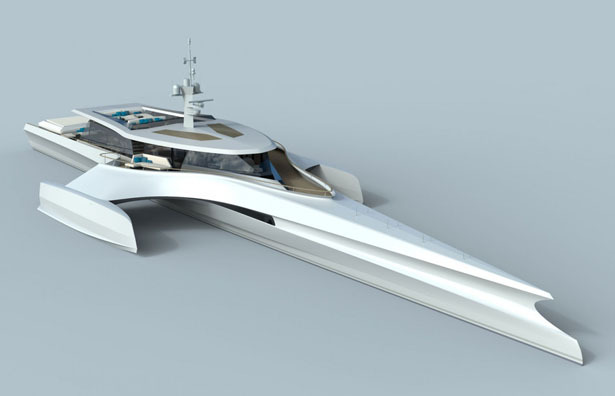 Nigel Irens yacht design is a beauty. There are several popular design trends going on with this 55 footer, the most notable being the slightly modified Tumblehome wave piercing hull, now being introduced in the new Zumwalt class of US destroyers. The inverted bow is designed to cut through waves rather than riding over them. Purpose built as an explorer craft it will come in two sized, 57.5 meters, dubbed the "Origin 575" and 70 meters, named "Explorer 70". The 70 meter model comes with a helo pad, of course. The design is the culmination of work already done on the Ocean Eagle 43 (seen below in sea trials). Designed for a top speed of 28 knots, and a 4-5000 nautical mile range at 18 knots these boats will be quite a site to see at flank speed.